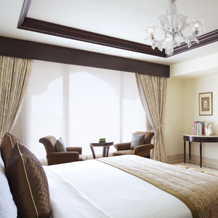 The Presidential Suite, located on the top floor of the hotel, offers breathtaking views. The suite has elaborately furnished interiors with a separate sitting room, king-sized bedroom and dining room. The Presidential Suite office has a commanding round table for meetings and fax machine with a direct line phone. On top of the prestigious décor, the magic of the suite is that it opens out on to a private terrace with an attached private swimming pool. One of the fines rooms in Taj Krishna , Hyderabad to enjoy the luxury.